The first question that surely arises is: "Can I use Acrobat Reader DC to reorganize PDF pages?" Taking pages from an existing PDF is, of course, technically possible, but you should use a special PDF software for this purpose. That makes it a little simplified for you. Extracting PDF pages from an existing PDF file is possible with an easy-to-use PDF program designed especially for this purpose. 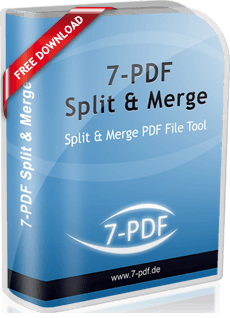 7-PDF, Germany has developed the Tool 7-PDF Split and Merge for this purpose. With this FREEWARE, it will therefore be quite easy for you to take an existing PDF document pages! In addition to extracting individual pages, the tool also allows them to extract areas of pages as freely definable groups of page areas, as well as extracting pages via odd and even page numbers. To do this you start the PDF Splitter software, select your desired PDF document from which you want to extract pages and define the type of page removal via the clearly arranged user interface. Then start the process with the button "Split this PDF!". You can choose for the extracted PDF pages a space on your hard drive, or specify for this purpose a fixed space. Both options are possible and can be saved as a default. A particularly useful feature is the ability to use a dynamic filename prefix, which, depending on which constant is used, can be used, for example, to automatically copy the current page number into the extracted PDF pages. From the extraction of individual PDF pages to freely selectable page areas, they are highly flexible. Our PDF Split and Merge software should help you to reorganize PDF pages through these very useful features. Supplementary function: Combine your PDF files flexible and easy! In addition, the software also offers the possibility to combine PDF files with each other, ie to merge them directly and thus to merge PDF files. This further useful PDF function complements the PDF feature presented here in detail, thus rounding off the portfolio of this PDF Split and Merge software.